Intro by Zack: The Old Fashioned Cocktail is my recent go-to drink at a bar. I've tried a lot of different interpretations by various bartenders and Mel's recipe is my favorite. Her recipe balances the strength of whiskey with the sweetness / spice of the mix. Mel and Peter are our good friends who were ex-pats in Belgium with us. We had many good nights talking and laughing over many meals. They're always cooking up something adventurous and interesting. I hope you enjoy this drink mix as much as I did!! My husband, Peter, and I have been cooking, drinking, photographing and sending ridiculous e-mails with Zack and Lauren for nearly seven years now … on two continents. Most recently, we spent a year-and-a-half as neighbors in Antwerp with the Koulermos, including two phenomenal New Year’s Eve parties. 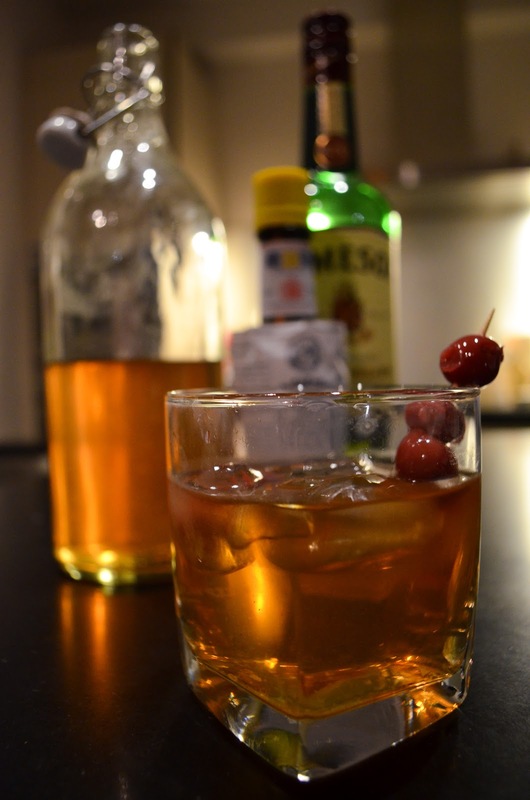 Peter and I wanted to whip up a special cocktail to ring in 2015, specifically using homemade Maraschino cherries. Our Old Fashioned cocktail mix is an homage to our Midwestern upbringing (Old Fashioned cocktails made with brandy are particularly popular in Wisconsin, my home state). Here are the easy recipes for Maraschino cherries, Old Fashioned mix, and a proper Old Fashioned cocktail. After making these, you’ll never use the atomic red ones from the grocery store ever again. Maraschino is a sweet, clear liquor from the Dalmatian Coast. You should be able to find it at any liquor store that has a reasonably sized spirits section. This recipe comes from Ted Allen. Bring the cup of liquor to a simmer. Turn off the heat, but leave the pan on the stove. 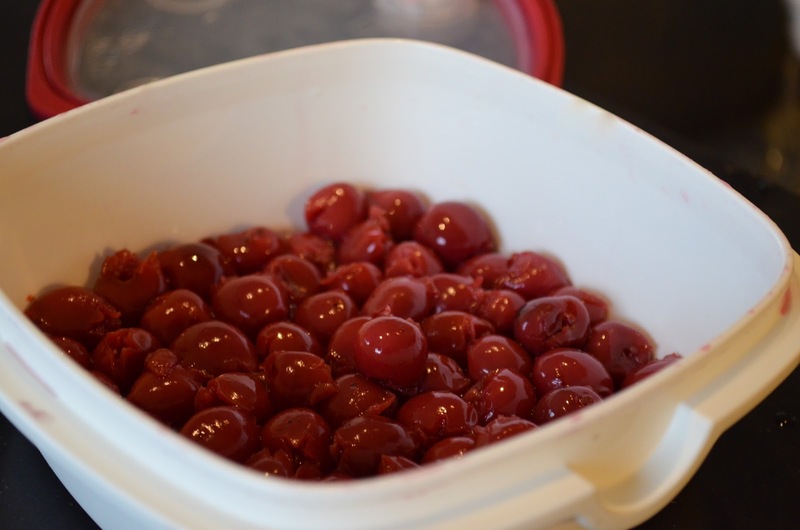 Stir in the cherries gently (you want whole cherries when you’re finished), and let cool completely. Store in a jar and refrigerate. Process: Bring water and sugar to a boil in a saucepan; remove from heat. 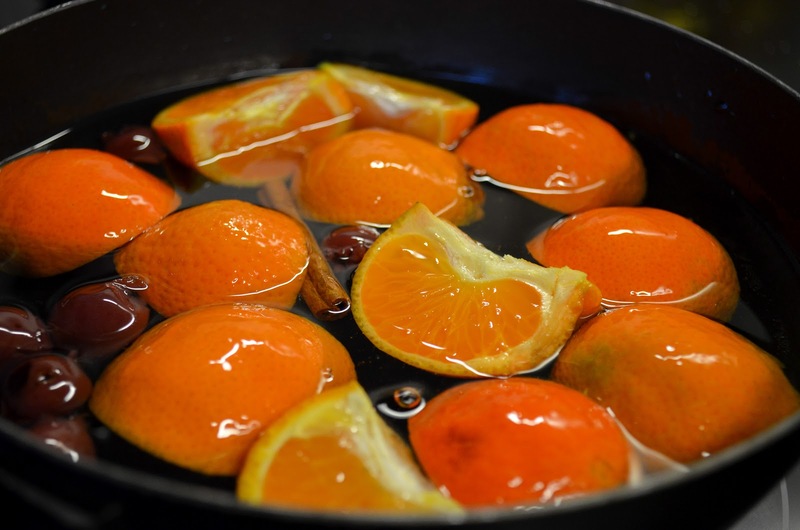 Stir oranges, cherries, and cinnamon stick into sugar mixture. Cover saucepan and steep for 1 hour. Remove fruit and cinnamon stick from mixture using a slotted spoon; stir in bitters. Let cool, then store refrigerated. Recipe adapted from Allrecipes.com. In a rocks glass, combine the mix and the bitters. Add the ice cubes, then pour whiskey over. Garnish with cherries.